Tswalu Kalahari Reserve (27°13'30''S, 22°28'40''E; 930 m a.s.l.) is the largest (> 100 000 hectares) privately owned wildlife reserve in South Africa. It lies in the Northern Cape province, at the foot of the Korannaberg Mountains (Figure 1). Kuruman is the closest large town, some 140 km east of Tswalu. 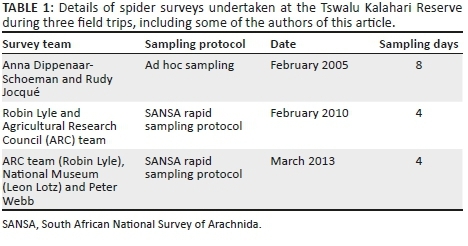 Material from three surveys (Table 1) was used to compile the first checklist of the spiders of TKR (Appendix 1). During the first visit to the reserve, spiders were collected ad hoc in all five habitats in the reserve (Figure 1) using a variety of methods, and no set protocol was followed. The second and third surveys were carried out using the standardised protocol devised for SANSA and described in detail by Haddad & Dippenaar-Schoeman (2015). It can be briefly summarised as follows: four representative habitats in a selected degree-square grid were selected by the field work manager, in this case the third author, and sampled by a team of four collectors. 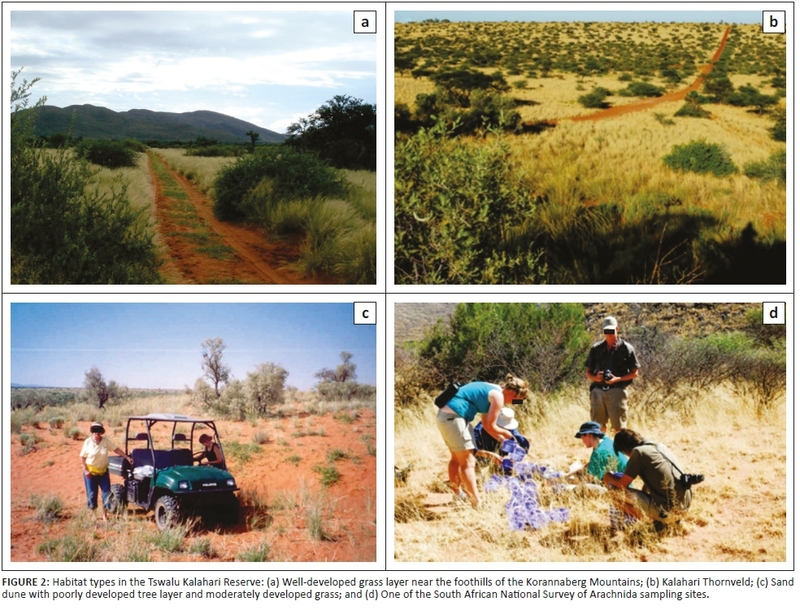 During the second and third surveys, sampling was carried out in grass layer around hills forming part of the Korannaberg-Langeberg Mountain Bushveld, Olifantshoek Plains Thornveld, Gordonia Plains Shrubland and Kathu Bushveld (Figure 1). In each of these habitats sampled using the SANSA protocol, 500 beat samples were taken from woody vegetation using a beating sheet and beating stick; 500 sweep samples were taken from grasses and herbaceous vegetation using a sweep net; 50 pitfall traps (buckets with diameter of 135 mm) were set out 2 m apart and kept open for 3-4 days; ten leaf litter samples were taken and sifted over a white sheet using a steel sieve with a mesh spacing of 9 mm. Further, in each habitat, all four team members conducted 2 h of hand collecting during the day from beneath logs, rocks and bark and from vegetation. Night collecting (2 h per person) was done in all four habitats, as opposed to the single habitat required by the SANSA protocol. Winkler traps were used to extract leaf litter samples taken in a single habitat (Olifantshoek Plains Thornveld) during the second survey only; this method yielded poor results and was not used during the third survey. Regarding conservation status, species that were only recorded from immatures or that represent new taxa were not evaluated, and are considered to be data deficient for taxonomic reasons (DDT). Species with a broad distribution (categories 0-2) were considered to be of Least Concern (LC); those of categories 3 and 4 were considered to be South African endemics (SAE); and those of category 5 were considered to be Northern Cape endemics (NCE). No Reserve Endemics (RE, category 6) have been recorded from TKR yet. 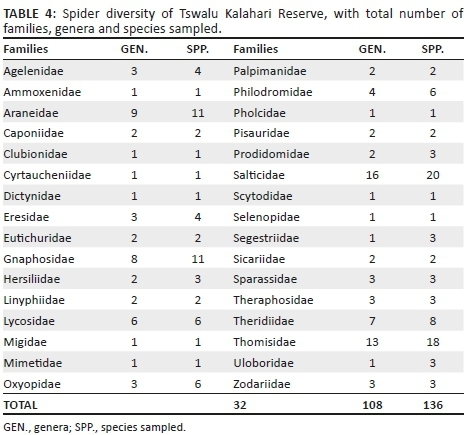 Thirty-two spider families represented by 108 genera and 136 spp. were collected from TKR between 2006 and 2013 over a total of 16 sampling days (Appendix 1, Table 4). Except for one species, Tusitala barbata Peckham & Peckham, 1902 (Salticidae), the rest of the species are reported from the reserve for the first time (Azarkina & Foord 2015). 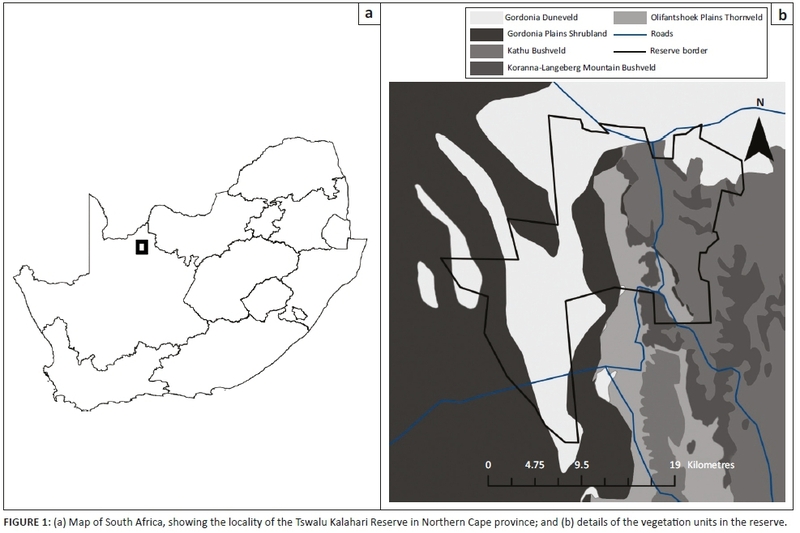 Although the Northern Cape is South Africa's largest province, covering 29.7% of the land area, only 1990 records sampled from 124 sites in the Northern Cape are accessioned in the SANSA database, represented by 490 spp. from 49 families (Dippenaar-Schoeman et al. 2015). Based on these results and information from the SANSA database, the number of species sampled in reserves and parks in the Northern Cape is much lower (80-140 spp.) compared to Limpopo reserves, which average 228 spp. per reserve, ranging between 175 and 286 spp. (Foord et al. in prep.). Of the 136 spp. sampled, ten spp. (7.4%) were DDT and could not be identified to species level, of which four spp. were immature and six spp. are possibly new to science (Appendix 1, Table 3). However, these putative new species are representatives of species-rich families, and only after revisionary studies would it be possible to tell whether they are indeed new to science. No species sampled from TKR thus far can be considered RE. Only the South African endemic species falling into categories 3-6 (33 spp., 24.3%) need to be evaluated using the IUCN criteria. The majority of the species sampled (93 spp.) can be listed as LC, having a distribution throughout southern Africa or wider (Table 3). The plant wanderers sampled from the grass and tree layer are represented by 42 spp. (30.9%). The Thomisidae (16 spp. ), Salticidae (eight spp.) and Oxyopidae (six spp.) were the most diverse plant-dwellers found on grasses, shrubs and trees. Three salticid species occur both on the ground and on vegetation (Appendix 1). 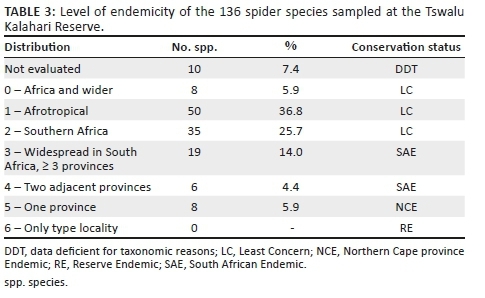 Some interesting results have already been published regarding the presence of Peucetia viridis (Blackwall, 1858) (Figure 3k) of the family Oxyopidae, which was sampled from the unpalatable Kalahari sour grass (Bushman's Grass), Schmidtia kalahariensis. This annual grass is only available for a short period after good rains. It has an unpleasant smell and is covered with glands that produce an acidic substance. During the survey in 2008, this was the dominant grass present and it was intensively swept, but only this one species was recorded from the grass (Dippenaar-Schoeman 2005; Vasconcellos-Neto et al. 2007). Several species were sampled from trees, including the long-spinnered bark spiders, Hersilia sericeaPocock, 1898 (Hersiliidae) (Figure 3l), and the community nest spiders, Stegodyphus dumicola Pocock, 1898 (Eresidae). 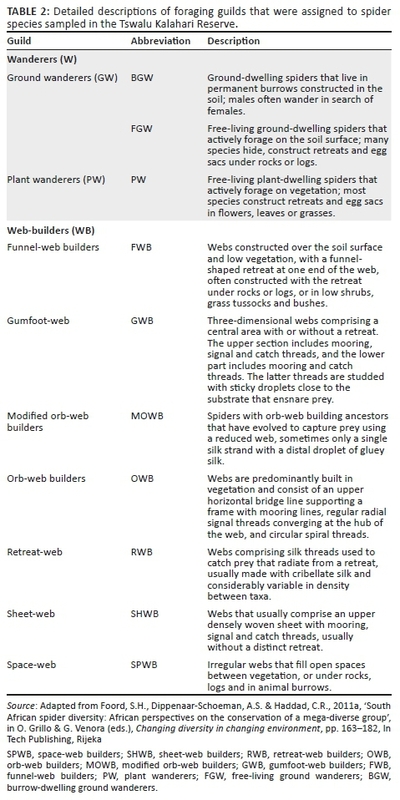 The physical structure of the habitat plays a role in the composition of the web-dwelling fauna, as it not only provides the necessary support for anchoring webs but also increases the availability of retreat space and modification of the microclimate, which could have an effect on spiders, as well as their prey. Most of the OWB recorded belong to the Araneidae (11 spp.) (Figure 3m and n), which construct large orb-webs between trees and shrubs. Some of these species are diurnal and they are found in their webs during the day. Some orb-web builders are associated with grasslands (Araneus, Larinia, Nemoscolusand Neoscona) and are mostly nocturnal, making their orb-webs at night and resting in retreats, usually constructed in grass inflorescences, during the day. One species is a MOWB, the tropical tent-web spider (Cyrtophora citricola [Forsskål, 1775]). Several gumfoot-web spiders of the Theridiidae (eight spp.) were sampled, including two button spiders that are of medical importance, Latrodectus geometricus C.L. Koch, 1841 (Figure 3o) and L. renivulvatus Dahl, 1902. The authors would like to thank the Agricultural Research Council (ARC) and the South African National Biodiversity Institute's (SANBI) Threatened Species Programme for funding the South African National Survey of Arachnida (SANSA) phase 2; Duncan MacFadyen of E. Oppenheimer & Son trust for providing permission to sample in Tswalu Kalahari Reserve and the officials of Tswalu for their friendliness and assistance; the staff of the Arachnology section of the Biosystematics Programme, ARC - Plant Protection Research, notably Connie Anderson, Sma Mathebula and Petro Marais, for their assistance with processing the material collected; Elisabeth Tybaert (wife of Rudy Jocqué), Petro Marais and Michael Stiller (ARC) for assisting during the fieldwork; and Galina Azarkina for assistance with the Salticidae identifications.